I just finished a draft of my first five size, fitted, top down sweater pattern. I’ve made a few multi-size patterns. My Gynnes Cardigan has two sizes, but that only required changing the back width and a bit of thought to the sleeves. I also have a hat pattern in three sizes, but again, that was just a matter of changing the circumference and aligning it with the pattern repeat. This was a bit different. Five sizes from XS to XL, fitted with waist shaping, and including some border lace with a six stitch repeat. Also a top down seamless construction, so I had to calculate the sleeved cap knit in short rows. I started by making a very detailed spreadsheet with over 150 rows that calculated each and every major number for the pattern. I used main two resources to do this. First, in 2015 I took JC Briar’s very excellent Manage Those Numbers class at Stitches West and her handout and my sample spreadsheets from the class helped immensely. I especially appreciate the concept of making everything possible a formula off of key numbers so if you change those numbers everything else changes along with it (more on that in a minute). She was also great about pointing out some key functions that make pattern writing easier. Second, I used Faina Goberstein’s Craftsy class Sizing Knitwear Patterns. 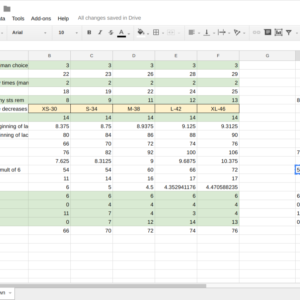 From it I learned quite a bit about how to organize my spreadsheet and use color to keep track of sizes and which numbers would go in the pattern and which would not. Discussions from the designer’s forums on Ravelry gave me some other clues and putting it all together was a multi-day job. Then I spent a few hours transferring those numbers to the pattern and writing out the directions as I referred frequently back to similar sweater patterns to make sure I was following the right conventions. It was exhausting but fun to really dig in and apply some new skills. At one point I realized I had not doubled a number that I should have and made sure it fit with another multiple later, but once I made the change to the key numbers, everything else just cascaded into place and a whole section was correctly updated. The pattern is under wraps until spring, hopefully I’ll be able to give some sneak peeks along the way! I have a new pattern out that ventures into new territory for me. Although I learned to crochet long before I learned to knit, I haven’t released any patterns until now that included crochet. I love both crafts and often say I am “bi-craftual.” Sometimes I look at a design and think, “That would be so much easier to do in [insert the other craft here].” With this pattern I combined what I consider the best of both crafts. 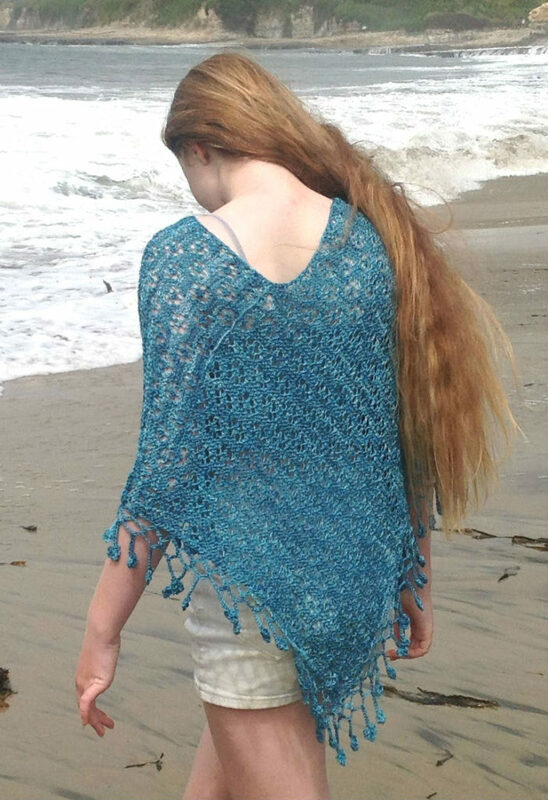 The body of the poncho is knit in a light garter lace pattern that molds to fit the wearer while the trim is crocheted in an open pattern with dangling flower motifs. In addition, a crocheted trim around the neckline provides stability in this area. I’m also venturing into new territory by hosting my first “a-long,” in this case a knit and crochet along for the pattern. You can find details on my Ravelry page where the K&CAL is being held. You can find the pattern on both Ravelry and Craftsy at this time and the K&CAL on my Ravelry group. Check out the pattern and come join the fun!